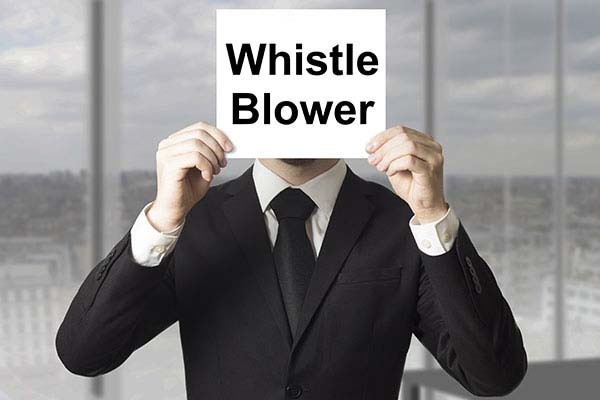 A “whistleblower” is a colloquial term defined in the Macquarie Dictionary as a person who discloses wrongdoing or illegal activity within an organisation to the public. The person will typically come from within the same organisation they are revealing information about. In an age where corruption doesn’t stray far from the trail of business and politics, and multiple mediums exist in which to communicate publicly, whistleblowing is becoming an increasing trend. Should we protect or penalise whistleblowers? How important is whistleblowing for public interest? Protecting whistleblowers is about upholding a great paradigm: the rule of law. What is the rule of law? It’s a phrase that’s often thrown around but rarely appreciated. The rule of law cannot be defined as one single concept, but embodies a principle under which a civil Western democratic society abides – that we are all equal before the law, that we should be ruled by the law and obey it, and that the government is as accountable to the law as members of the public. The rule of law allows us to freely criticise the law and its administration, and to hold governments accountable. Appreciating what the rule of law embodies may illuminate the reason why an employee or government official should be able to freely criticise or disclose corruption without fear of retribution. Whistleblowing is in the public’s best interest, and it does uphold the rule of law. The NSW Independent Commission Against Corruption (ICAC) had a full year in 2014, holding government officials accountable and determining activities by high level government officials who had been conducting politics above the law. Corruption seems to be the easy path these days, and integrity seems rare. Nowadays, while it’s said that business is politics, it’s also becoming clear that politics is a business. What follows from that notion is an increase in corruption, scandals, and people believing they can act above the law. This type of behaviour strikes at the heart of the rule of law and chips away at the integrity of civil society. Regrettably, many would-be whistleblowers feel that they are David up against Goliath – there is the fear of losing one’s job, the fear of being the centre of a media frenzy, or the fear of their personal life being attacked simply because they spoke up against corruption and held the government or organisation accountable. After a campaign that recognised whistleblowing as being in the public’s best interest and that whistleblowers require protection, the Federal Government introduced the Public Disclosure Act (2013). The legislation intends to promote integrity and accountability in the Commonwealth public sector by affording robust protective measures for someone who discloses wrongdoing in a government organisation. Each government agency must have an appointed authorised official who is responsible for taking the disclosure, commencing further investigation if necessary, and protecting the whistleblower. Protections for the whistleblower include keeping their identity confidential and applying criminal sanctions if the person is discriminated against (for example, termination of employment). The whistleblower will also not be subject to any civil or criminal liability for whistleblowing, unless of course their disclosure was false or misleading. What are some of the types of wrongdoing a person could disclose? They can include conduct which is thought to be against the law, corrupt, an abuse of public trust, and/or a waste of public funds or property. It may also include conduct that is discriminatory, negligent or unjust. In essence, the point of the legislation is to ensure that those within the system can be free to criticise the system or its players, and to hold people accountable. Rather than referring to the action as whistleblowing, the statute calls it a ‘public interest disclosure’. This is a positive step towards empowering a disclosure that is necessary for holding government agencies accountable. The legislated phrase does more than simply redefine the word, it empowers the action and highlights why the disclosure is required. In an age where the rule of law is being chipped away at, it’s important that any person feels free to be able to criticise administration and to publicly reveal anyone who is not acting within the law. This right is the true preservation of the rule of law. Injured in a Public Space: Who is at Fault?